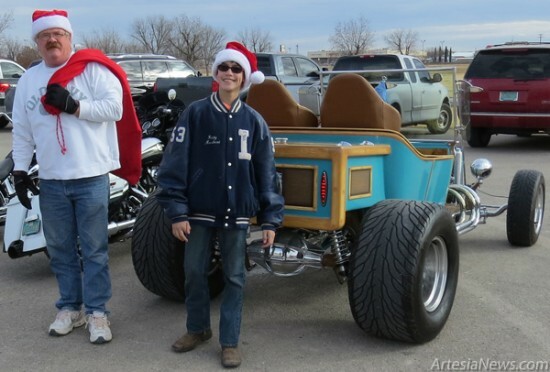 Above, Santa’s sleigh was modified to a 1923 T-Bucket driven by Kevin Rogers and son Riley Saturday for the Second Annual Toys for Tots Toy Run. 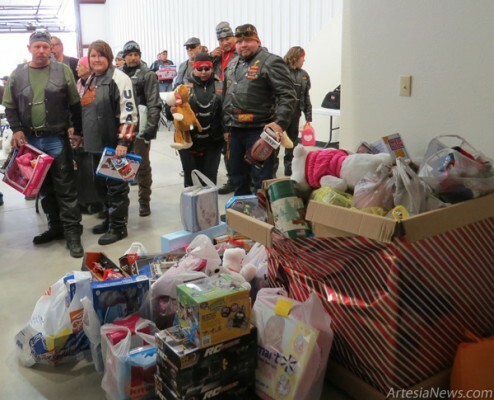 At top, members of several area motorcycle clubs gathered for the event to ride from Carlsbad to Artesia and collect toys for the organization, which distributes Christmas toys to area children in need. Toys can be requested on the Toys for Tots website, www.toysfortots.org. Concho Resources employees, Marines and motorcycle enthusiasts strove to bring Christmas to many children through their participation Saturday in the Second Annual Toys for Tots Toy Run with local band S.H.I.L.O. performing. The run was organized by L/Cpl. Andres Garcia Detachment 678 Marine Corps League members. Concho employees Ron Beasley, Bruce Jacks, Jerron Madrid and Zane Hodges coordinated efforts with the Guerreros Bike Club and Marine Corps League members Linda Ranes, Jeff Lara and Josh Curtis. … For the rest of the story, subscribe in print and on the web.